This Umbrella Bag measures 9" wide x 9 1/2" long x 2" thick with the attached straps making for a total length of 30" long. The adjustable straps feature gives each individual a customized fit, as well as making it convenient to be worn while sitting or standing. 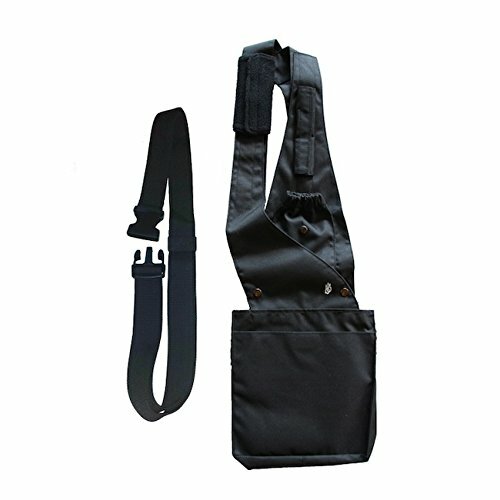 This Umbrella Bag also includes an extension strap to add length if needed. It allows the user to have an umbrella overhead while giving the hands free ability to do other tasks, yet still offering protection from the rain or sun. While attending an outdoor activity, walking to the grocery store, or riding a bike, the adjustable front straps make for this Umbrella Bag simple and easy to slip on and off. Another feature includes a webbed strap with a buckle fastener for use around the waist to hold the bag closer to one's body. This Umbrella Bag is ideal for seniors, busy moms, and the "on-the-go" individual where multitasking is current. This unique umbrella holder has been designed and crafted with care and thought. It is constructed from a durable polyester fabric, making it lightweight enough to fit comfortable, but strong enough to steadily hold all sizes of umbrellas. This polyester fabric also enables the use of screen printing on the Umbrella Bag itself. The front pouch has a snap, so an umbrella with a shorter handle can still be safely tucked in place and used. The pocket is also utilized for extra storage if needed. Moreover, this Umbrella Bag is large enough to comfortably accommodate one's essential items such as a wallet, cell phone, keys, book, bottle of water, snacks, and more. Overall, this Umbrella Bag is competitively priced and used by people of all ages and abilities.